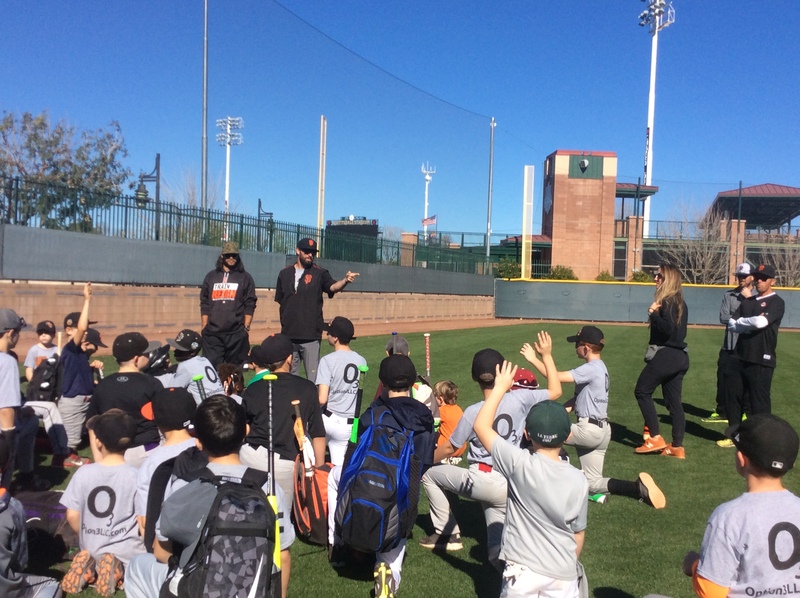 On the first day of baseball camp, we woke up early, had breakfast, and drove to Scottsdale. 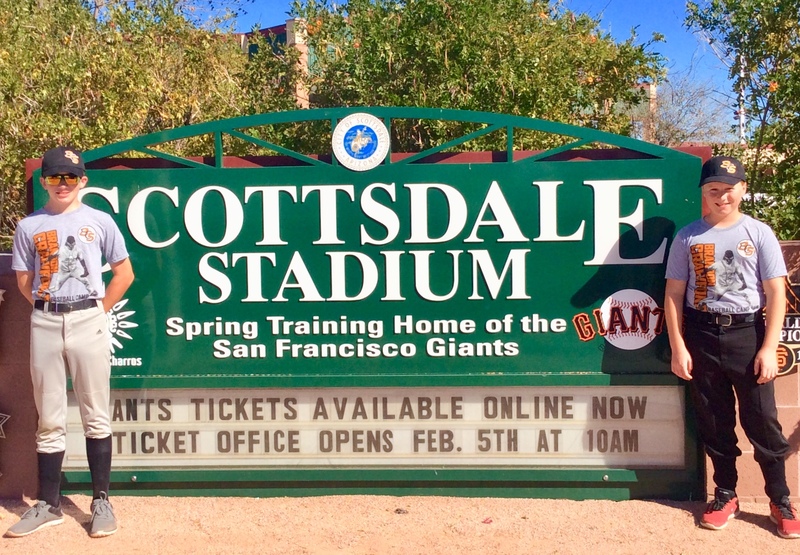 When we got to Scottsdale stadium, we signed in and went to the field, while the parents and family went to the observation deck (Mom, Dad, and Aunt Patti). The first thing we did was play two ball. Two ball is a game where you throw two baseballs to someone from one hand, and if they do not catch both of them, they get a point. You have to try to get as little points as possible. Next, we did warm ups. First, we ran from one side of the field to the other, and then they organized us in lines to throw and catch to one another. The coaches then organized us into small groups by age. There were many different stations that practiced different exercises with different coaches. It was amazingly well run! They had a set time of when to rotate to a different station. 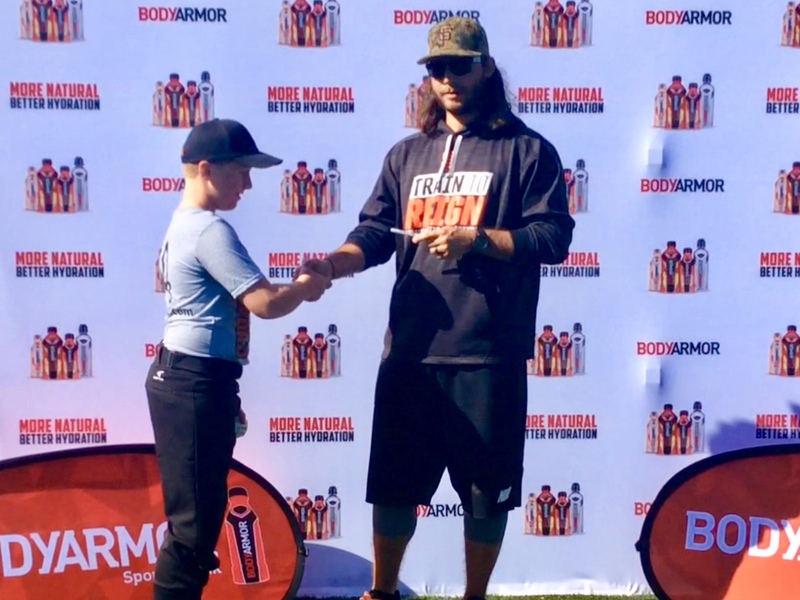 There was an outfield station, a Wiffle Ball station, a base running station, an off a tee batting station, an underhand pitching batting station, an overhand pitching batting station, a pitching station, an in-fielding station, and a bunting station. In the out-fielding station, they taught us how to catch balls properly. We also learned about “drop steps.” A drop step is when you take a step back to your right or your left depending on where the ball is coming from. This allows you to easily run backwards or forward for the ball. 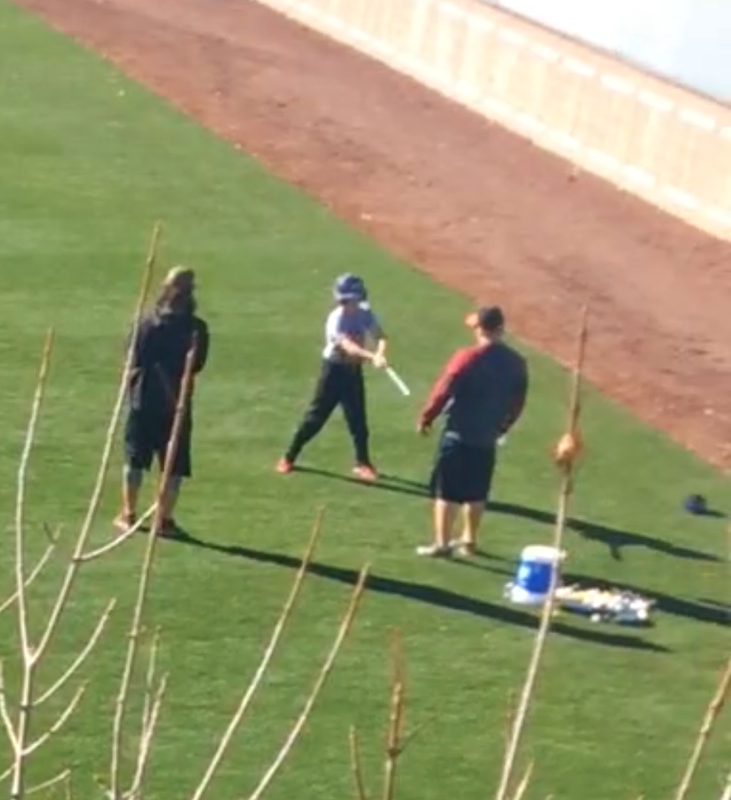 In the batting cages, everyone hit baseballs off of tees for practice. After batting off of tees, we hit balls that were thrown underhand by a coach. 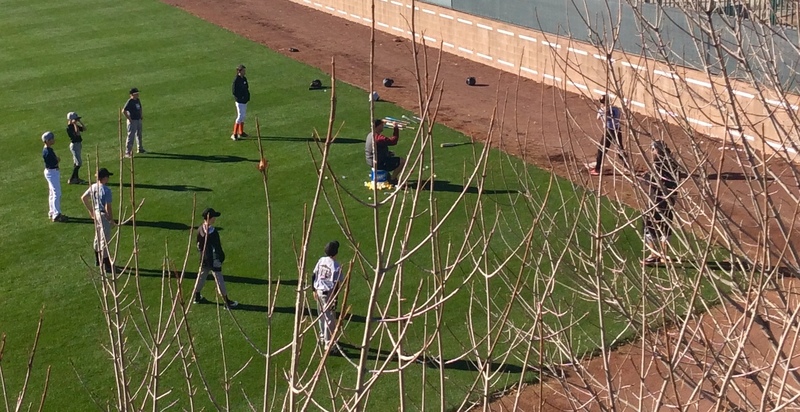 Next, we hit balls that were thrown overhand by a coach. At the base running station, the coaches taught that you should tag the inside corner of first base when you are going to keep running for second and same with all the other bases. 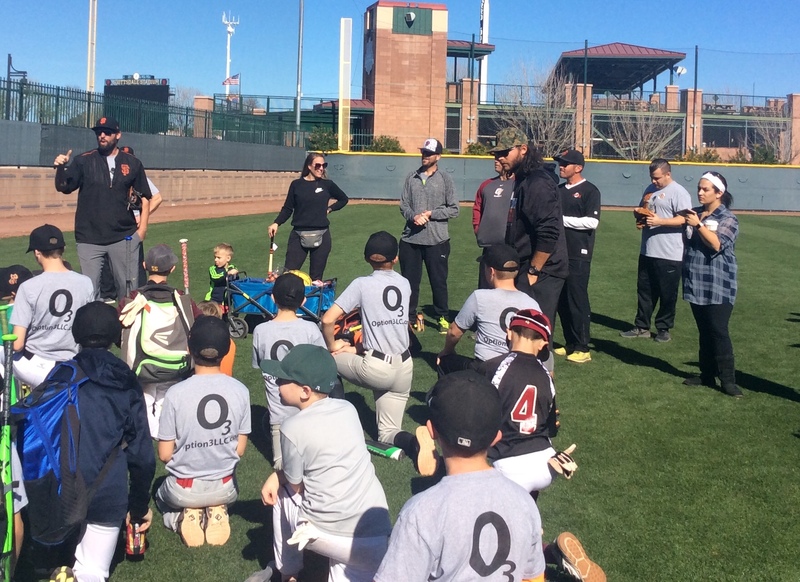 While at the pitching station, the coaches taught us how to deliver the ball properly. At the bunting station, we were taught how to hold the bat while attempting to bunt. While at the in-fielding station, we practiced fielding ground balls at short stop and throwing them to the first baseman. At the end of the first day of camp, they handed out prizes to the kids who did especially well. After camp, when we got back to the hotel, Ryan, Mom, and I decided to hike Mt. 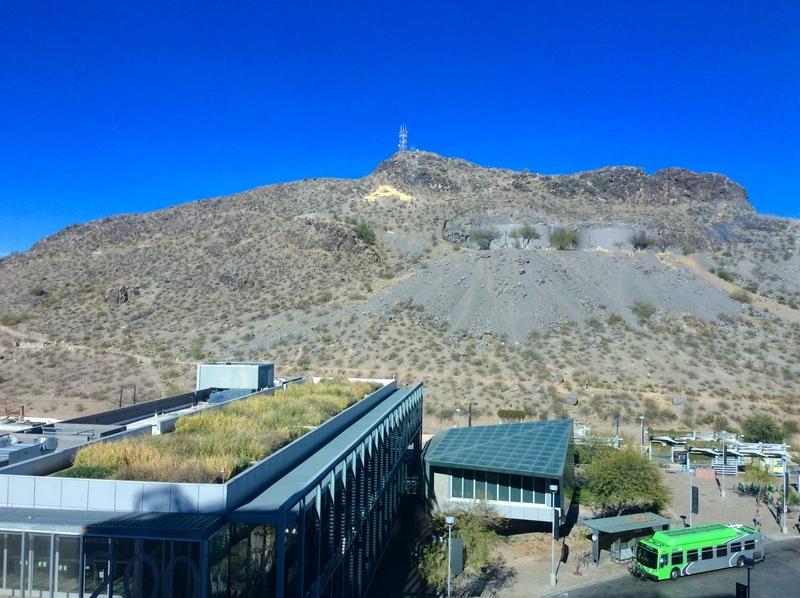 Tempe which was right outside our hotel. Along the trail, we saw lots of cactuses and other hikers. When we got to the top, we stopped and enjoyed the magnificent view. Going up and down Mt. Tempe only took about an hour. Next, we went to the hot tub on the roof of the hotel. We had an amazing day! On the second day of camp, we woke up bright and early to get ready. 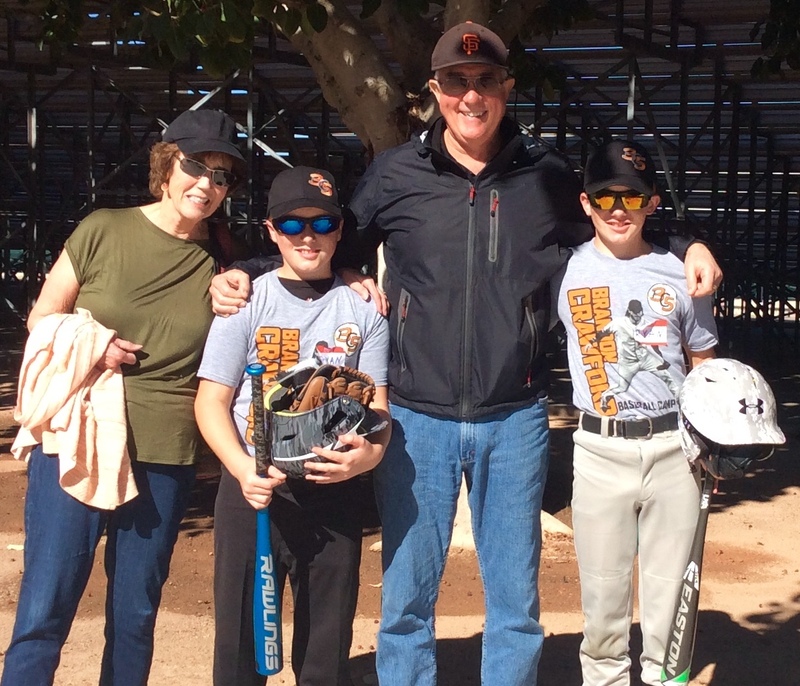 Just like the day before, we drove to Scottsdale stadium in Scottsdale with our mom, dad and Aunt Patti. We started the day off with more of the game, two ball. Then we did warm ups and went to our assigned stations. However, on the second day they did the stations a little differently than before. 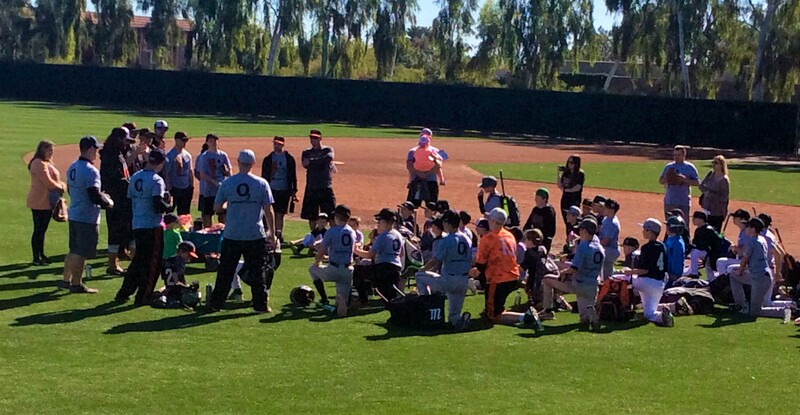 The coaches handed out prizes, such as bubble gum and sunflower seeds, to kids that did well. 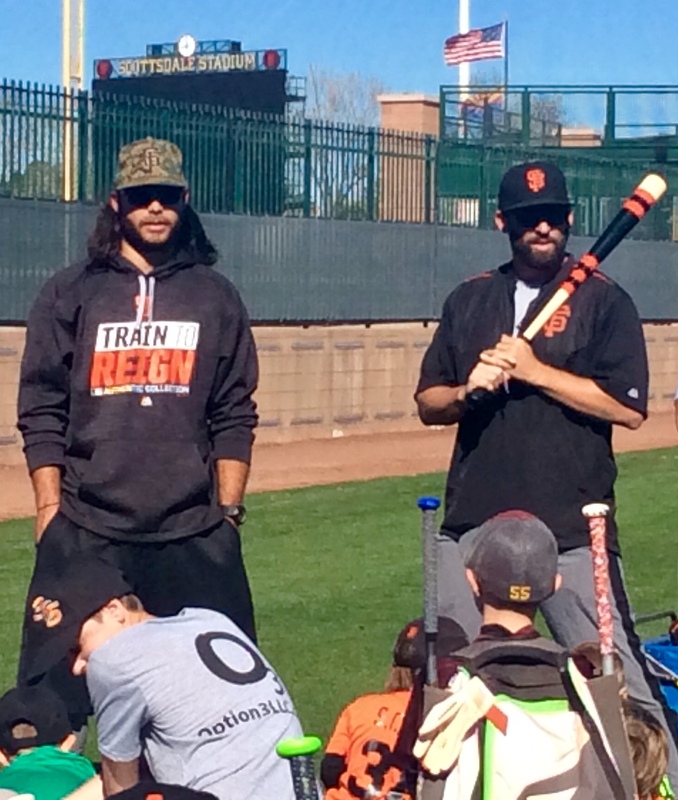 While in the batting cages, I was very excited when I got a tip from Brandon Crawford himself! He told both Ryan and me that we should swivel our back leg while batting for more power. If I had to choose, I think I learned the most at the pitching station on the second day. 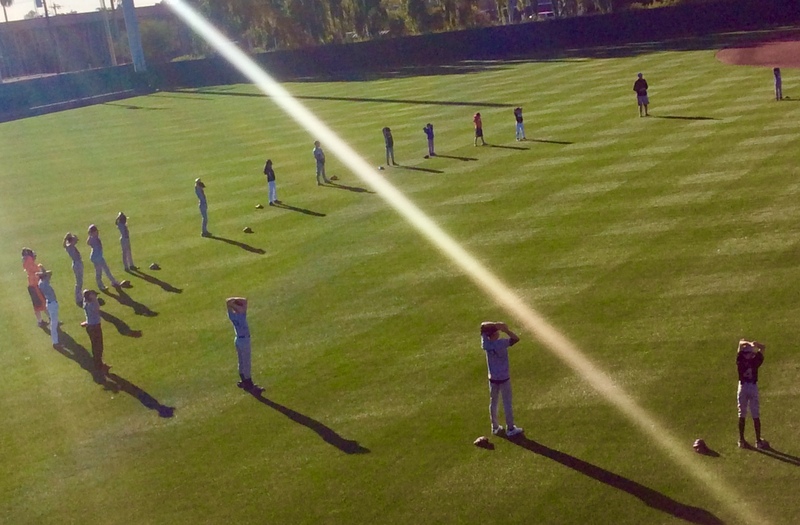 One of the coaches showed me that I should make a “W” shape with my arms while delivering the pitch. This helped improve my pitching accuracy tremendously! At the end of the day, the coaches handed out prizes again. I was very happy when I got picked for a prize by the pitching coach. My prize was a Gaylord Perry mini-statue. Gaylord Perry was one of the pitchers on the Giants who has been elected to the baseball Hall of Fame. 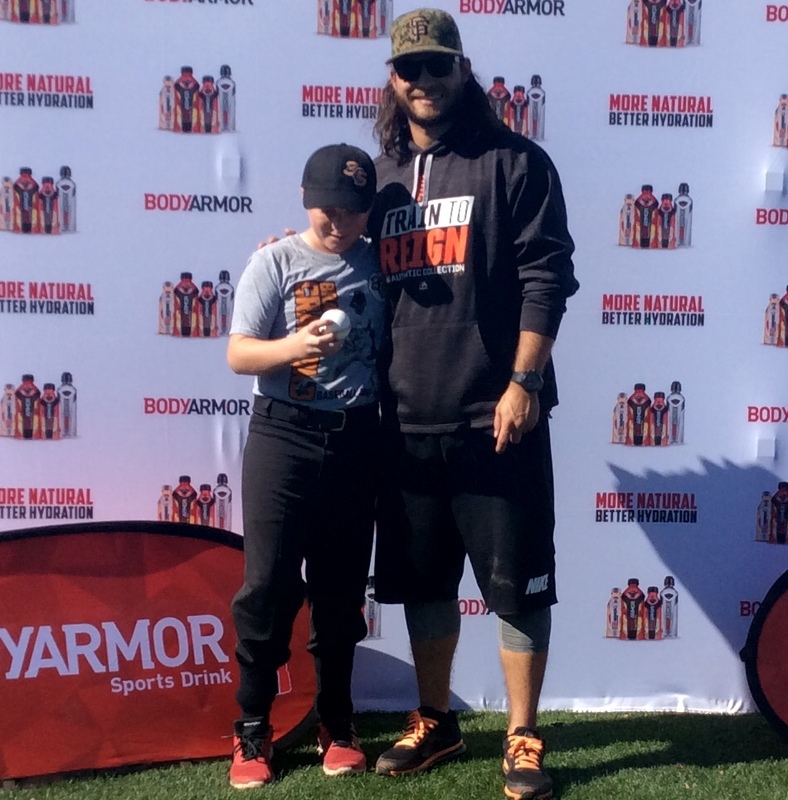 After I got my prize, Brandon Crawford walked over to Ryan and I and asked us our names. Then he chose my brother Ryan to get a prize too! Ryan got a Bruce Bochy gnome. Bruce Bochy is the Giants manager. The gnome looks hilarious! 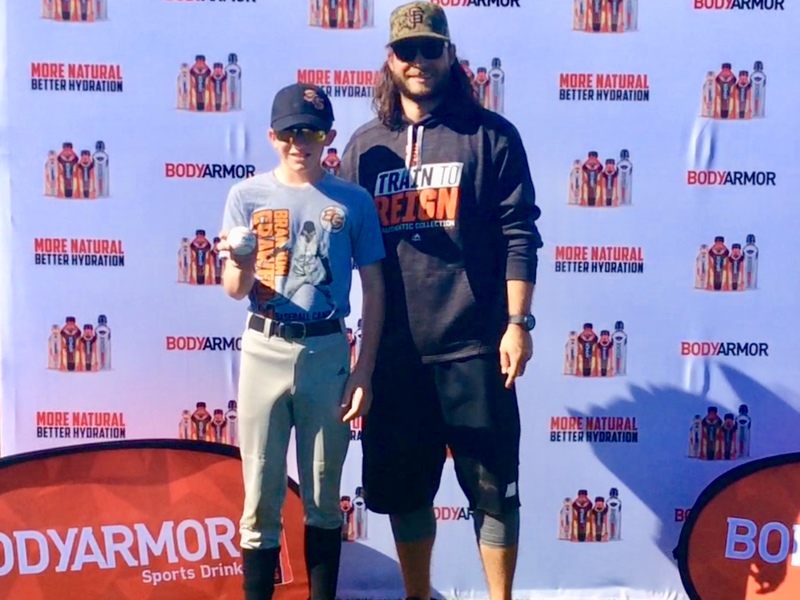 After giving out prizes, everyone formed a line to get an item of their choice signed by Brandon Crawford, along with a picture with him. Ryan and I had baseballs signed, and took pictures with him! Following the autographs and pictures, we returned to the hotel. The whole camp was an experience of a lifetime! 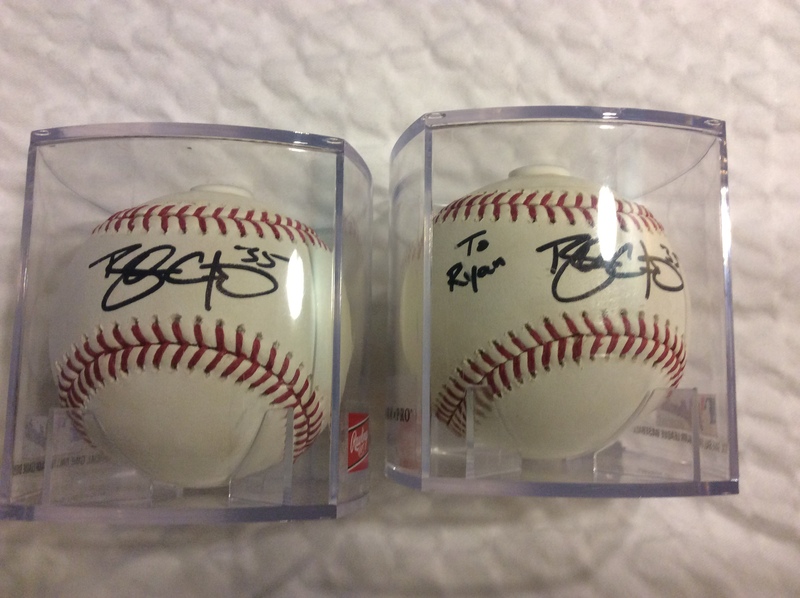 My brother and I now have signed balls from three (3) SF Giant players, Willie Mays, Buster Posey and Brandon Crawford! (See Willie Mays, one of a kind (2015/11/17) and A Giant Among Giants, Christmas Arrives Early in Grenada (2015/12/20). To top it off, all of the proceeds from the camp were donated to the Buster and Kristen Posey Fund. 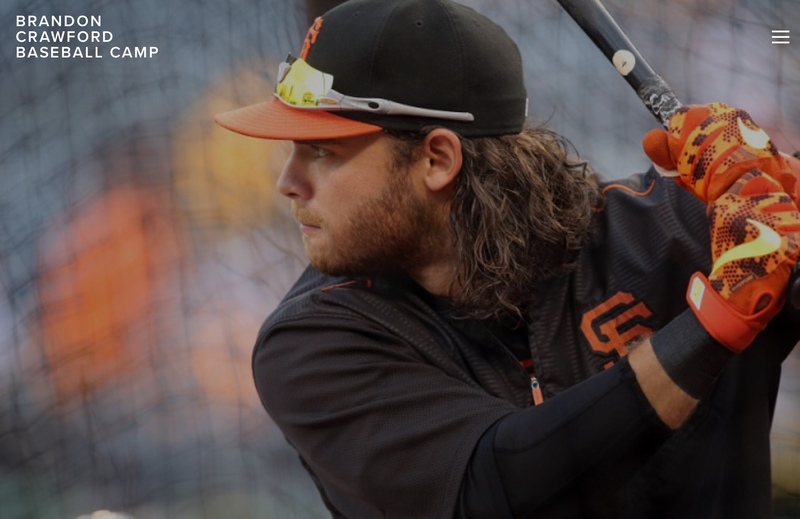 Buster Posey is a teammate of Brandon Crawford’s and is the catcher for the San Francisco Giants. The Buster and Kristen Posey Fund is a charity that provides grants to research hospitals and organizations that support children diagnosed with pediatric cancer. To check out, or donate to the Buster and Kristen Posey Fund, click here. 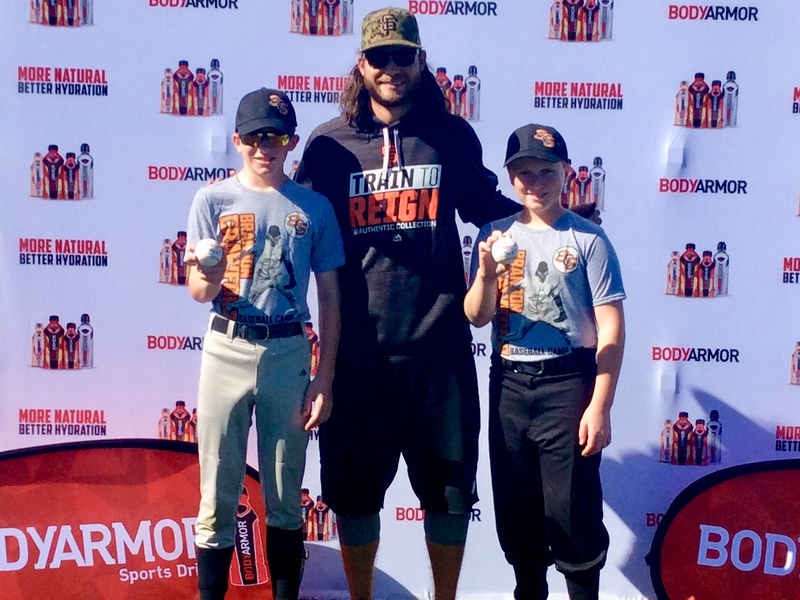 For information on future Brandon Crawford Baseball camps, click here. This entry was posted in Homeschooling, St. Lucia, Windward Islands and tagged #24, #28, #35, 2018 Giants, AZ, Bcraw35, Brandon Crawford, Brandon Crawford Baseball Camp, Buster and Kristen Fund, Buster Posey, Chad Chopp, San Franscisco Giants, Scottsdale, Spring Training, St. Lucia, West Indies, Willie Mays on February 14, 2018 by Ronan. As we have communicated to you before, the cruising community is different than that which our land based neighbors are accustomed to. We are, by definition, a group of transients with different itineraries, capabilities and goals. 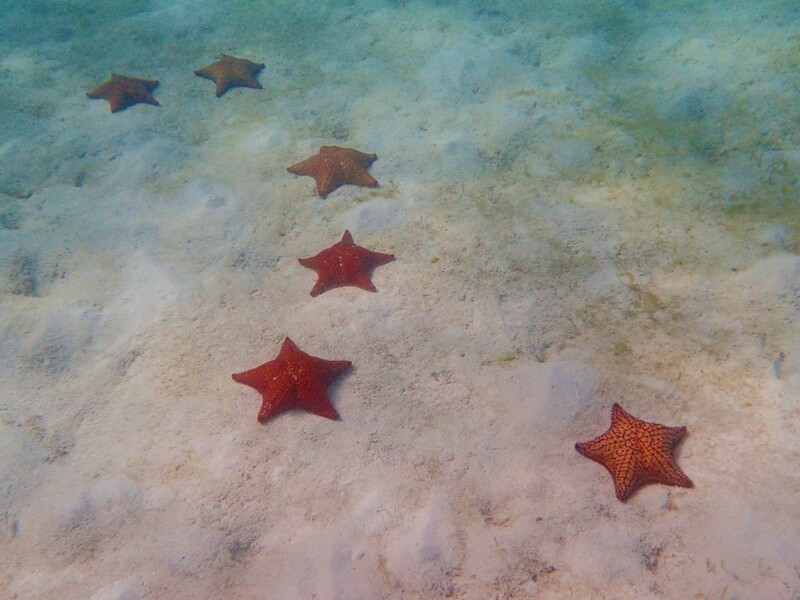 We have been cruising in the Caribbean for over 3 years now and we have crossed and recrossed paths with dozens of cruising families that we have enjoyed sharing our cruising dream with. Having passing acquaintances with other families is just part of the lifestyle. That said, we have developed some unique and close bonds with a select few. One of the special cruising families that we have shared a particularly close friendship with is John and Paulette Lee of M/V Seamantha, a Kadey Krogen 58′ trawler. We first met John and Paulette in the British Virgin Islands 3 years ago during our initial trip south through the Caribbean. When we arrived to spend our first hurricane season in Grenada, we ended up with a slip right next to Seamantha in the Port Louis Marina. John and Paulette spoiled our Cocker Spaniel, “Patton” with fresh bowls of his favorite vegetable, cauliflower, on the aft deck of Seamantha. They have watched our boys, Ryan and Ronan grow from little boys into capable young men. 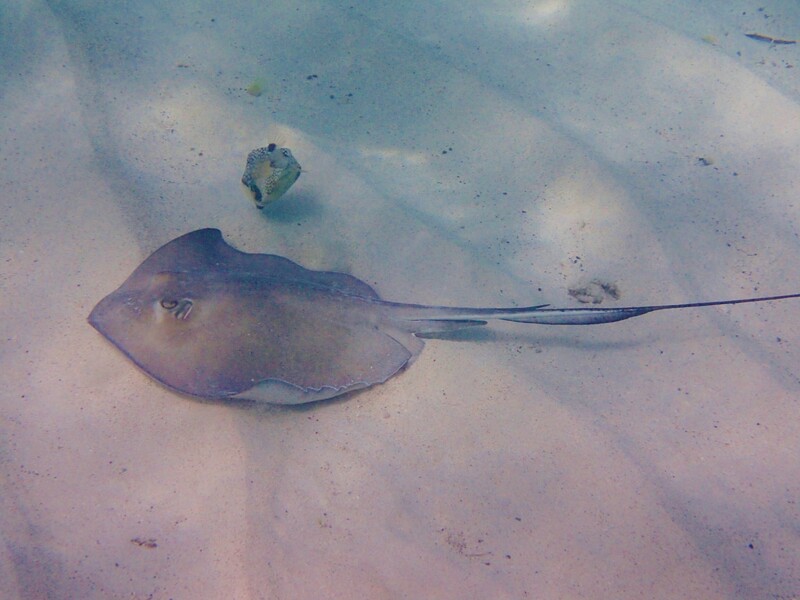 Throughout our trip, we have shared countless wonderful experiences with our cruising buddies. As the saying goes, friends are the family that you get to choose and John and Paulette have certainly become a big part of our family. After watching the devastation and subsequent recovery of the Caribbean after one of the worst hurricane seasons on record, we have decided it is the appropriate time to turn the Pilots’ Discretion north and head back towards the United States. We are actually looking forward to retracing our route through the Caribbean and points north. It will be an opportunity to revisit some of our favorite spots. With our decision to turn north we have arrived at another one of those intersections in the life of a cruiser. Our friends on M/V Seamantha are departing St. Lucia this week to head south and so it is that we have arrived at Yoggi’s infamous fork in the road. Pilots’ Discretion and Seamantha will be taking divergent paths which in many ways is sad. We will not be saying goodbye, but rather, we will say “until we see you again.” So, as you depart Seamantha, we wish you fair winds and following seas. 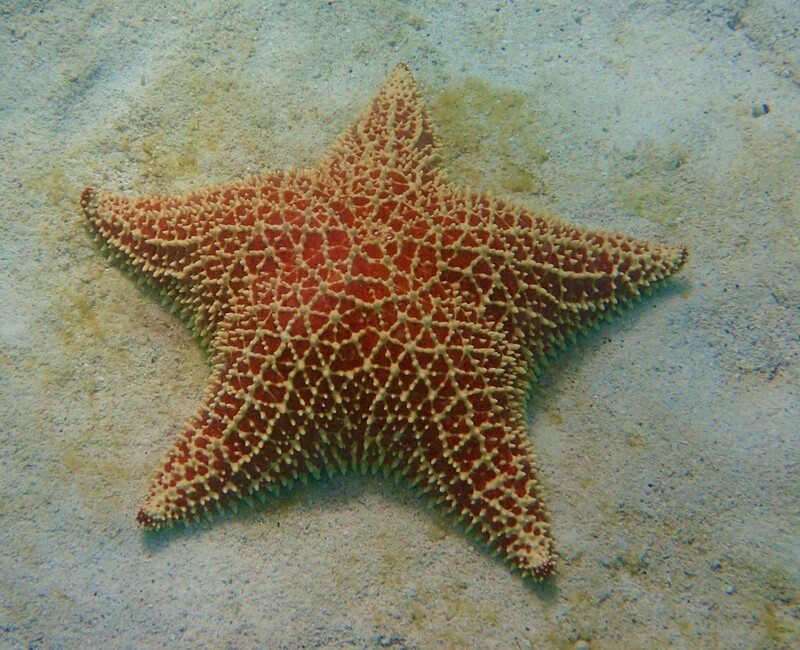 This entry was posted in Bequia, British Virgin Islands, Grenada, Grenada, Grenadines, Mayreau, Petit St. Vincent, Petite Martinique, St Vincent and the Grenedines, St. Lucia, St. Vincent, Tobago Cays and tagged Bequia, Dive St. Lucia, Grenada, Krogen 58, Mayreau, New York Yankees, Petit St. Vincent, Petite Martinique, Seamantha, St. Lucia, St. Vincent, St. Vincent & the Grenadines, Tobago Cays, Yoggi Berra on January 17, 2018 by Randy. Leaving the Tobago Cays astern, cruising just outside of the exclusionary zone for the underwater volcano, Kick ’em Jenny, we spotted Grenada, our summer home port for our second hurricane season, immediately on the horizon. 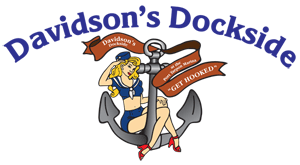 We cruised down the leeward side of the island, past the small fishing village of Gouyave, and into our summer home port in St. Georges harbor. After clearing immigration and customs, we hoisted the courtesy flag of our host nation. While we endured typical Grenada passing showers on the day we arrived, we had many sunny days ahead of us. 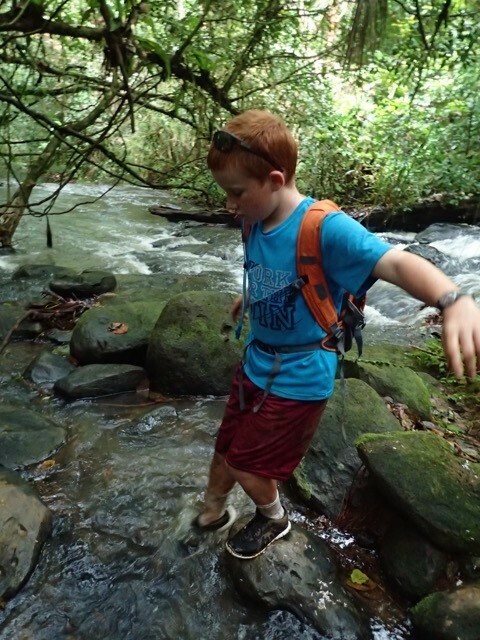 With school out for the summer, the boys immediately set out looking for some summer fun and adventures. Since this is our second summer in Grenada (see A Day in the Life of Grenada, 2015/08/02), we were already familiar with the lay of the land. We did not miss a beat getting back into the swing of the weekly, often wet and muddy, but always scenic and fun hikes (a.k.a. “hashes”). 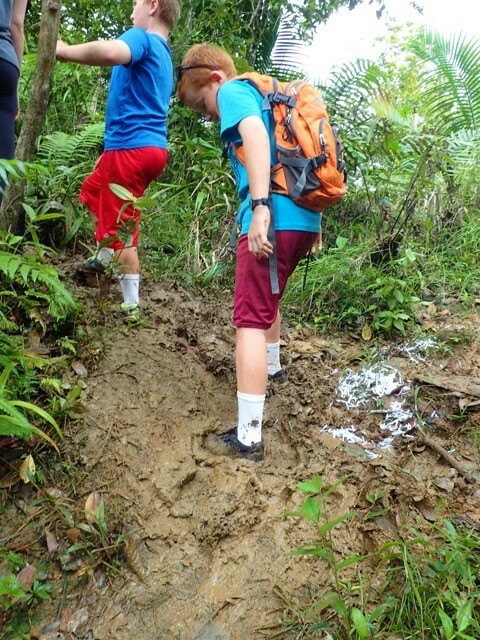 Ronan and Ryan hiking in Grenada … just a little muddy. The shredded paper marks the trail. 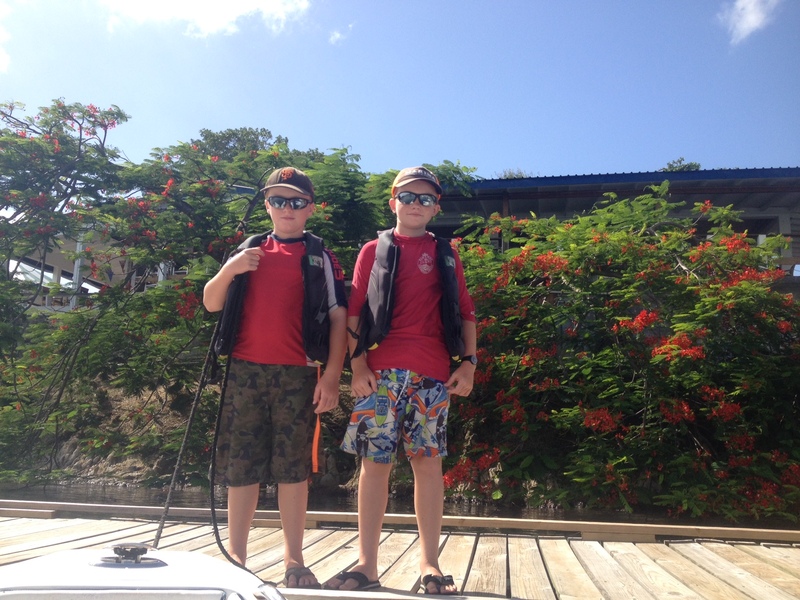 There are a lot of other ‘kid boats’ riding out the hurricane season in Grenada, so much so, the boat kids have their own morning net on the VHF radio to communicate and organize events. 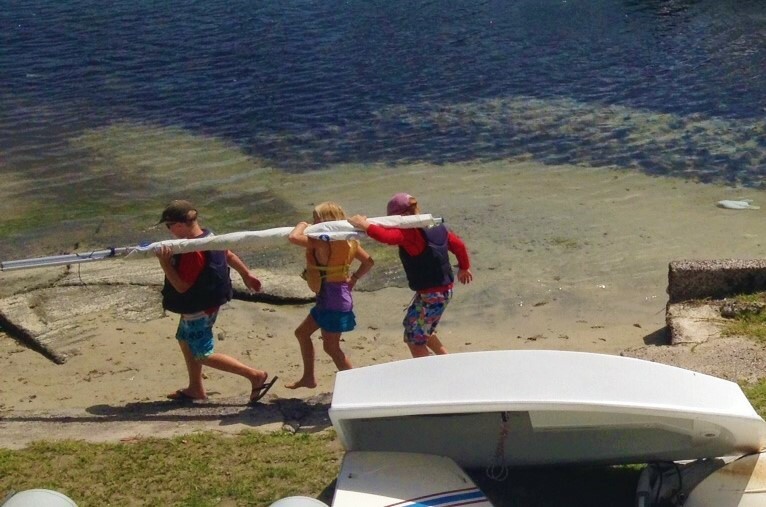 The ‘Kids Organized Society’ (KOS, pronounced K-os, or chaos) meets weekly at Secret Harbor for a variety of fun activities. 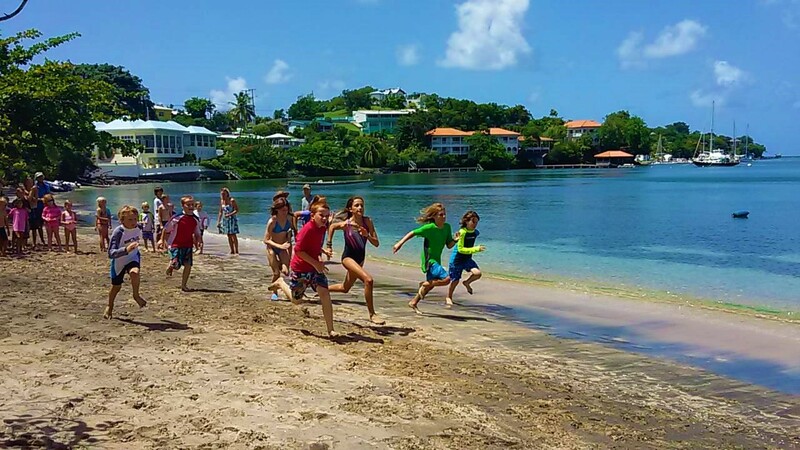 In the spirit of the 2016 Olympic games, the kids came together on Calabash Beach, Prickly Bay, for a mini-Olympics. 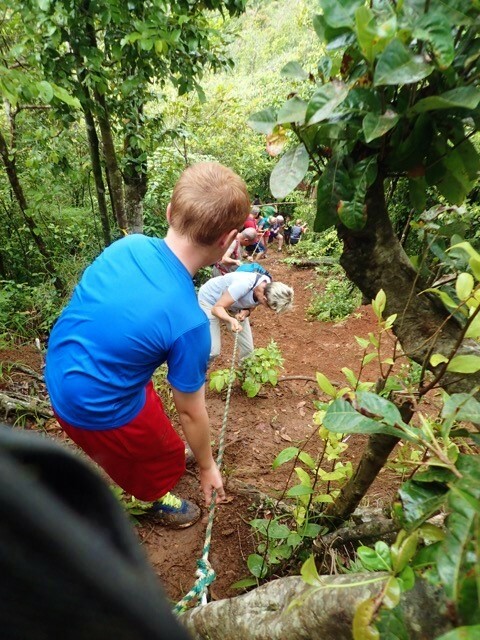 There were relay races, three-legged races, swimming competitions and the ever popular tug-of war! Another fun adventure we enjoyed this summer was a river tubing birthday party! 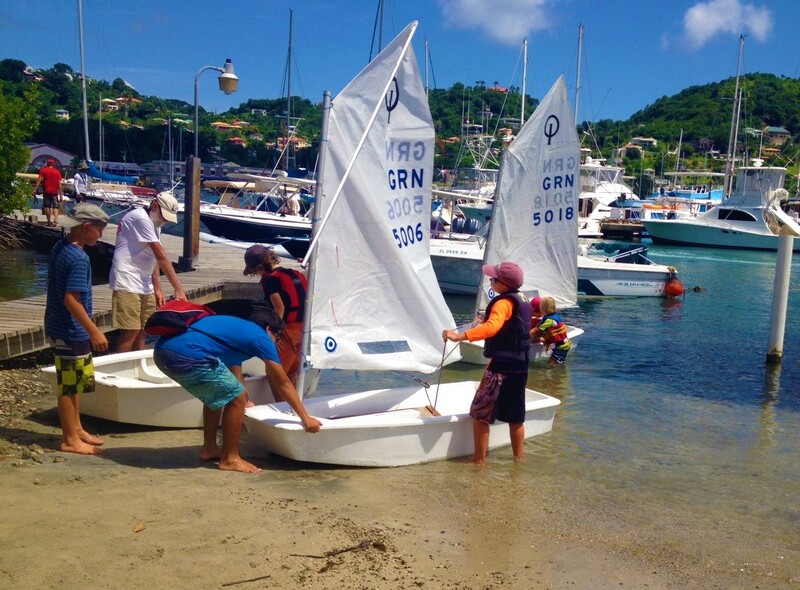 This entry was posted in Grenada, Grenada, Kick 'em-Jenny, Windward Islands and tagged Grenada, Grenada Yact Club, Hash, hiking, Kick 'em Jenny, Mini Olympics, Port Louis Marina, Sailing, Sailing Camp, St. Georges, Tubing on September 3, 2016 by Theresa. Today we learned that our good friend Willie Mays has been awarded our nations highest honor for a civilian – the Presidential Medal of Freedom. We could not be happier or more proud of this recognition for our dear friend Willie. Willie has been both an inspiration and role model for our family through multiple generations. He has been a man that has always had time to spend helping young kids understand the importance of a good education, a solid work ethic and when all else fails, he has been there to get his own checkbook out to make certain that kids from all walks of life have an opportunity to succeed. Willie is undoubtably one of the greatest athletes to ever play the game of baseball, but to those of us that know him personally, he will always be so much more than that. Congratulations Willie, we are proud to call you our friend. This entry was posted in Grenada and tagged education, kids, Presidential Medal of Freedom, San Francisco Giants, Willie Mays on November 17, 2015 by Randy. For the past nine months, our family has been cruising south, through the Caribbean including to and through the Bahamas, Turks & Caicos, Dominican Republic, Puerto Rico, Spanish Virgin Islands, U.S. Virgin Islands, British Virgin Islands, St. Martin/St. Maarten, St. Bart, St. Eustatius, St. Kitts & Nevis, Guadeloupe, Dominica, Martinique, St. Lucia, and St. Vincent & the Grenadines. 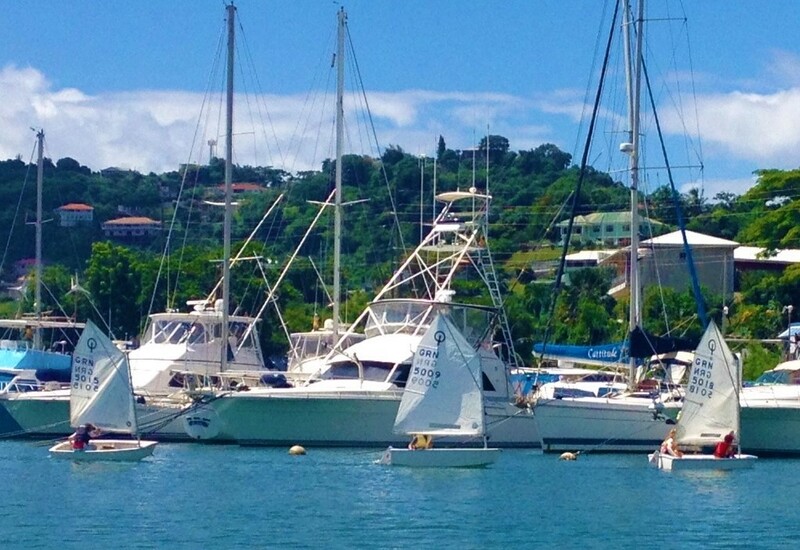 Alas we have arrived in our summer home, Port Louis Marina, St. George’s Harbor in Grenada! 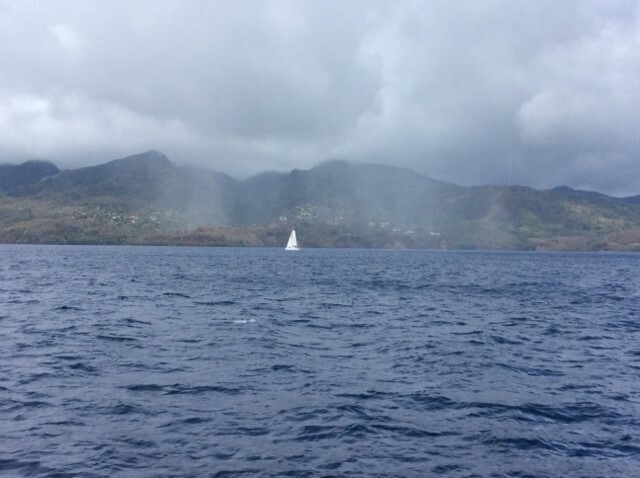 After departing the serene Piton anchorage in St. Lucia we set a course towards St. Vincent & The Grenadines. 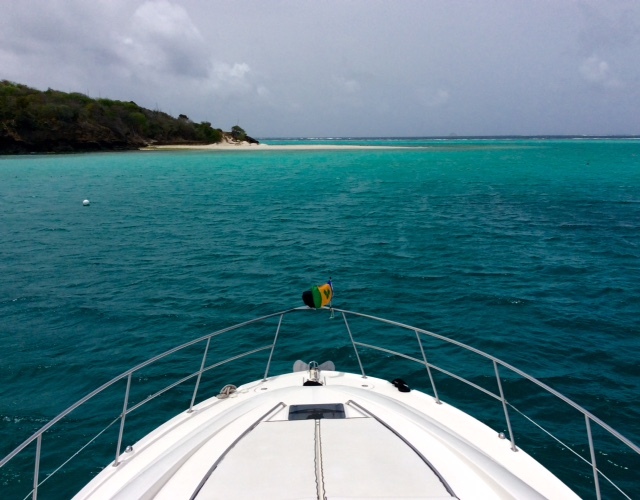 Upon arrival, we opted to pick up a mooring ball in Charleston Bay in Canouan, the Grenadines. The bay, formerly home to a Moorings base that has apparently been closed down, was virtually empty the day we arrived. With only one other cruising boat in the harbor we moored within 30 yards of the beach just off the Tamarind Resort Hotel and enjoyed a pleasant evening ashore. During our brief period ashore, we found the locals to all be pleasant and helpful. We discovered a charming beachfront restaurant with tables set in the sand from which we enjoyed our dinner while watching the sunset over Charleston Bay (the name of the restaurant was the Coconut Bar and Grill and the owner’s name was Ezera. Ezera and his beach dog “beachboy” made sure that everyone including our Cocker Spaniel, Patton were well taken care of). From St. Vincent southward to Grenada there are literally dozens of small to medium sized islands, each with it’s own distinct personality and allure. 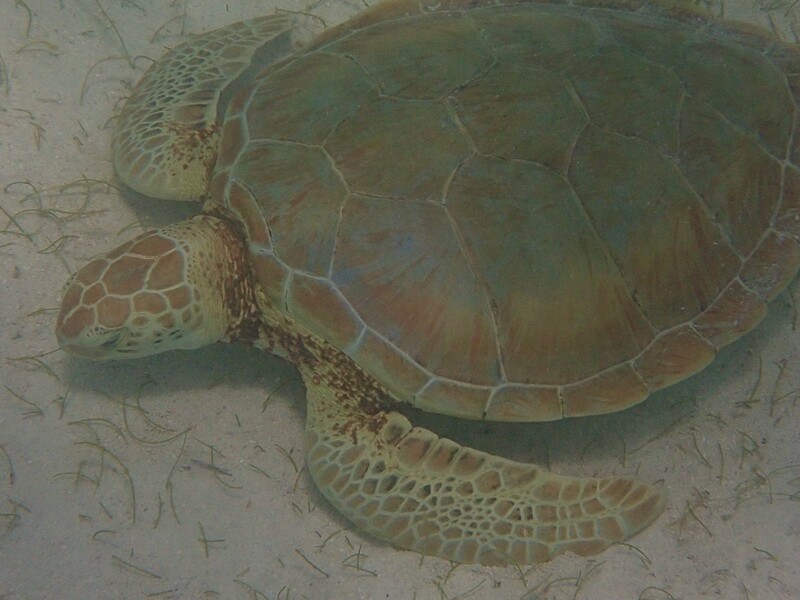 Unfortunately, we have arrived too late in the season and must press on to Grenada but to be sure, we will be exploring as many of them as we can when we make our return trip northward. With the “hurricane season” upon us, our boat insurance requires us to position the boat south of 12o30” north of the equator. 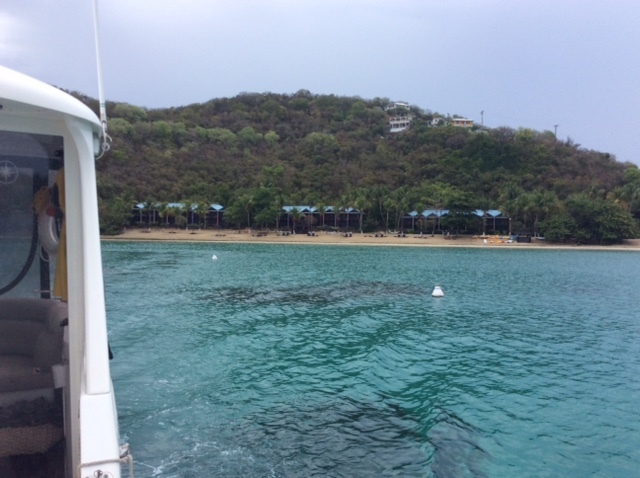 As such, we departed Canouan and continued our journey south towards our summer home marina in Grenada. 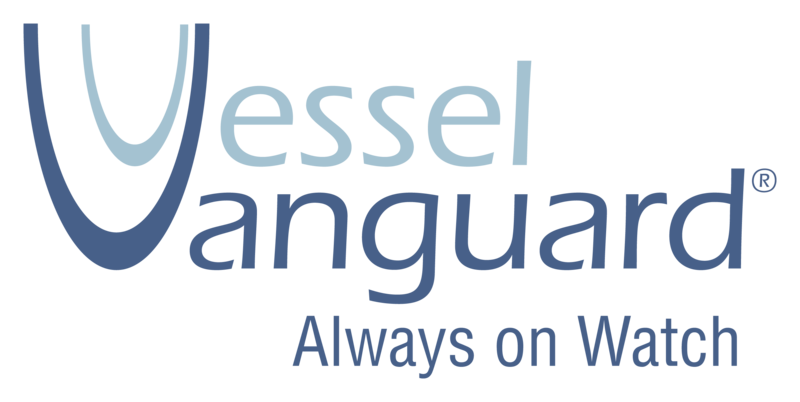 Since our course took us in close proximity to “Kick ’em Jenny,” an active under water volcano, prior to departing Canouan we obtained an Eastern Caribbean volcanic activity update at: http://www.uwiseismic.com/. Kick ’em Jenny has a reputation of kicking up nasty seas and she did not disappoint on the day we cruised by. 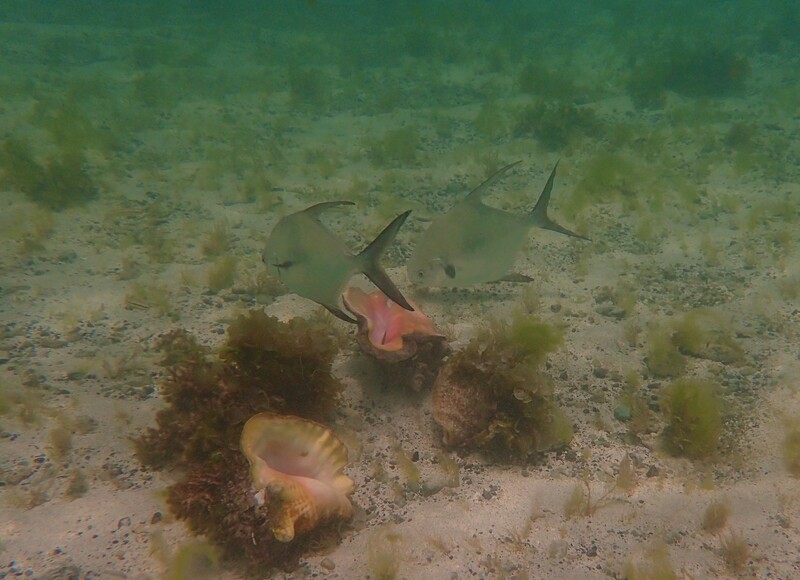 Despite staying well clear of the 1.5 km safety exclusion zone, there was a noticeable shift in seas, which continued until we got into the lee of Grenada. 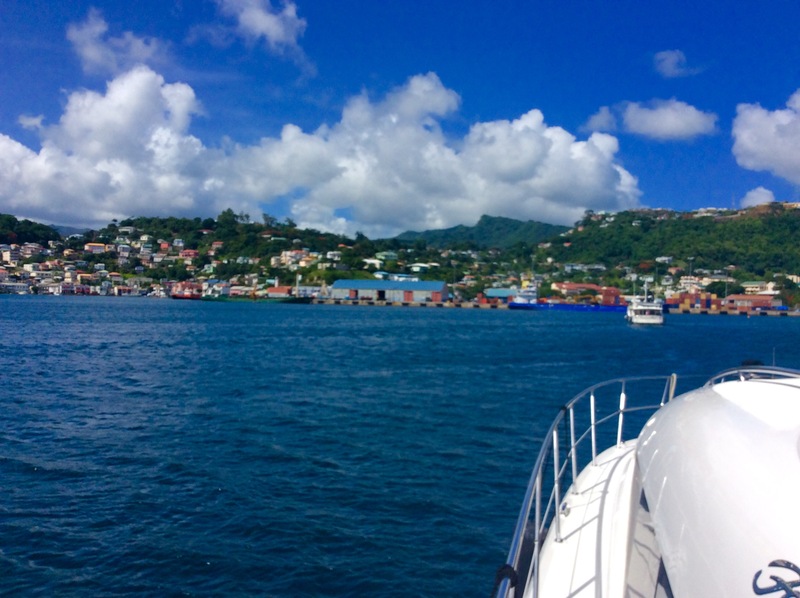 The island of Grenada has all along been our end of the Caribbean chain destination and so we had yet another surreal moment as we cruised into the sheltered lagoon at Port Louis Marina, Grenada in our own boat. Once settled into the marina, we set out to explore new our new summer home base. 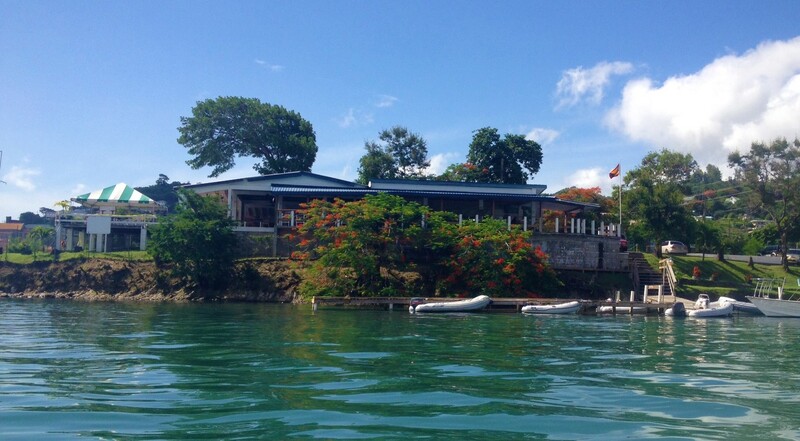 Since we will be here for several months, we will have ample time to explore Grenada at a leisurely pace. Already we have discovered a local hiking/running club which organizes weekly hikes in different locations around the island. 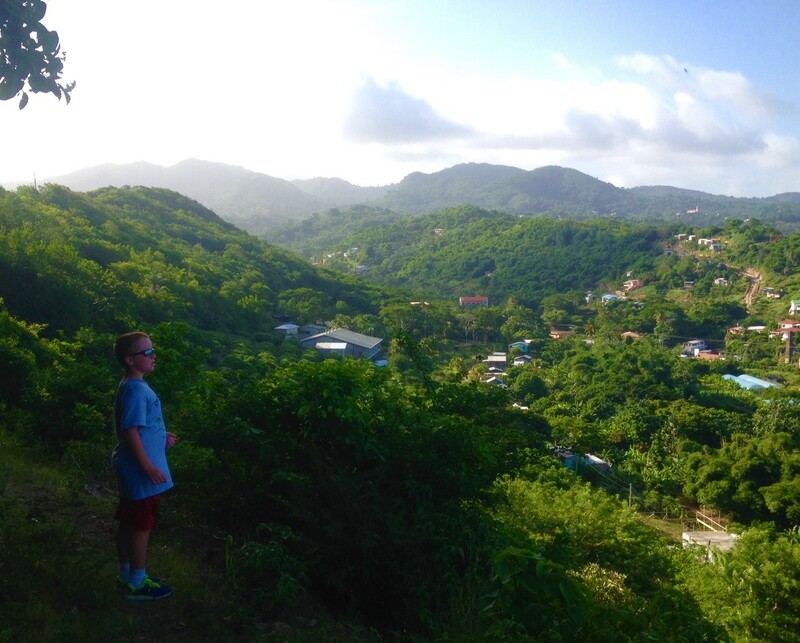 The boys have completed their homeschooling for the year and we are looking forward to exploring all that Grenada and the surrounding islands have to offer this summer. 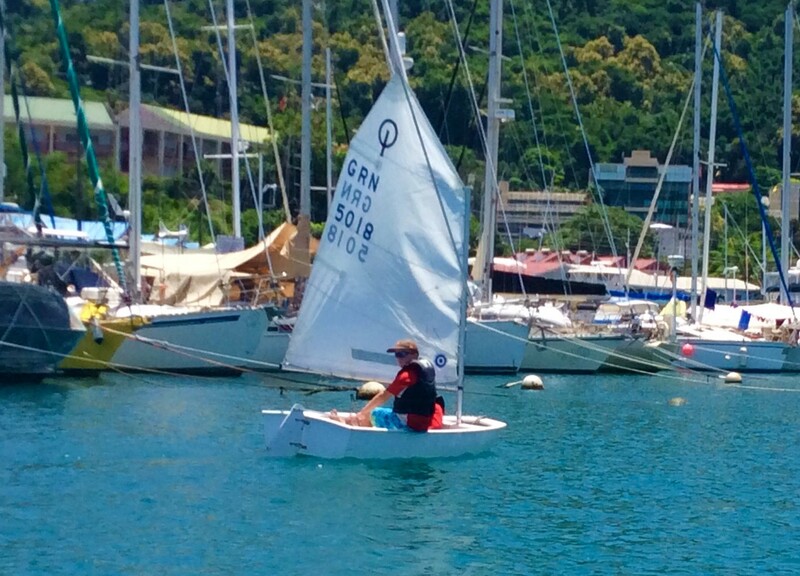 This entry was posted in Grenada, Grenadines, St. Vincent, Windward Islands and tagged Canouan, Grenada, Grenadines, Kick 'em Jenny, Port Louis, St. Vincent on June 27, 2015 by Randy.